"Edwin Lord Weeks (American, 1849-1903). Departure for the Hunt. Signed 'E.L. Weeks' and stamped with the artist's moghul device (lower left). Oil on canvas, 37½ x 27¼ in. (95.3 x 69.3 cm.). Lot Notes: Executed circa 1885, The Departure for the Hunt is an outstanding example of Weeks' Indian oeuvre, and represents a return to a familiar theme among his depictions of life in the Rajput princely courts of India. This painting depicts the gathering of a hunting party consisting of regal personages, servants, horses, and a trained cheetah in the forecourt of a palace. The casual scene, and Weeks clearly depicts it as such, is framed by a precise rendering of a red sandstone gate pavilion and stables, with a tantalizing glimpse of the white marble palace in the background. The red sandstone and white plaster walls, and wood details, are characteristic of north or north central India, and suggest that the painting is set in a Rajahstani city such as Jodhpore or Jaipur. Weeks produced at least two other notable versions of this subject, each altogether different in its setting and characterization. The Rajah Starting on a Hunt (Metropolitan Museum of Art), of similar size to the present painting, also features a princely figure on horseback with a cheetah within a palatial courtyard. 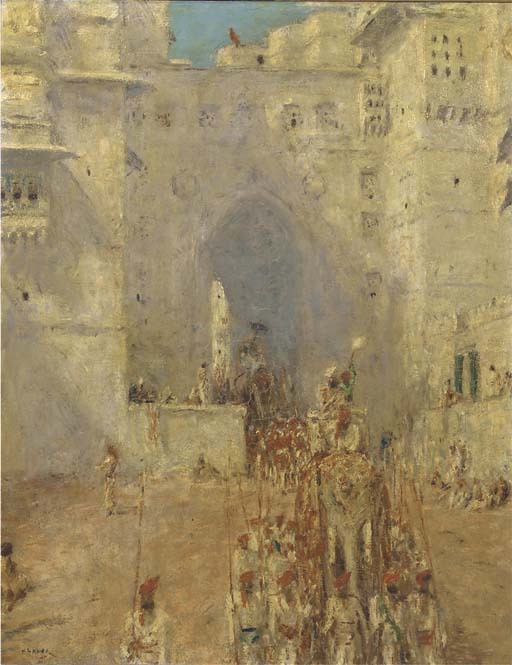 The other entitled Start for the Hunt at Gwalior (Private Collection), larger than the other two, depicts mounted princely figures, with following attendants, en route to the hunt through a city street. In each case, for Weeks the anticipation of the hunt was a more interesting subject than the hunt itself, as the preparation afforded the opportunity to depict both figures and animals in an evocative architectural backdrop. Weeks' extraordinary talent for the naturalistic depiction of animals, figures, and architecture is clearly evident in the present work, and remains largely incomparable among the Orientalist painters of his day. His virtuosity and keen eye for detail is balanced by a painterly suggestiveness, which sets Weeks apart from the brittle academicism of many of his contemporaries. In the present painting, these qualities draw the eye from place to place throughout the composition. Thus, Weeks allows the various elements of the painting to compete for our visual attention, while still maintaining a tight and precise compositional structure. Relieving all of the opulent detail is a broad expanse of cloudless cobalt sky, as the entire scene is depicted as lit by brilliant sunshine, relieved by cool shadows thrown across the walls and colonnades. 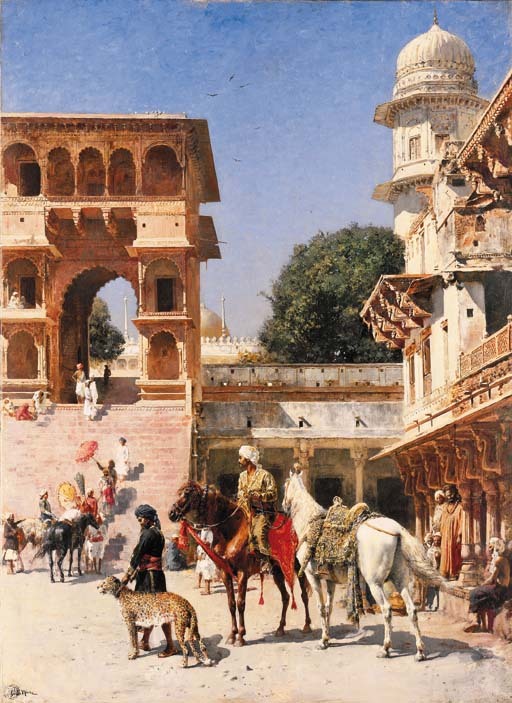 As with so much of Weeks' work, while every building is accurately drawn, and every surface of wall, garment, and animal is richly rendered, Weeks' painterly suggestiveness of detail elevates the present painting above mere pedantic academicism, as it depicts the visual richness of life in the Rajput courts." "Marius Bauer (Dutch, 1867-1932). Optocht met olifanten: a colourful procession in Udeipur, India, signed 'MBauer' (lower left); oil on canvas. 60.5 x 47.5 cm. Lot Notes: Marius Bauer's predilection for the Orient was apparent before he had ever visited the region. He was inspired by the writings of his contemporaries Lodewijk van Deyssel of the 'Beweging van Tachtig' literary movement and Marcellus Emants who had travelled to India in 1892/3. The commission in 1894 to illustrate the Oriental story Akkdyssiril by Villiers de l'Isle Adam, prompted Bauer to begin producing drawings and etchings with Indian subjects. It was not until 1897 that Bauer actually set foot on Indian soil. 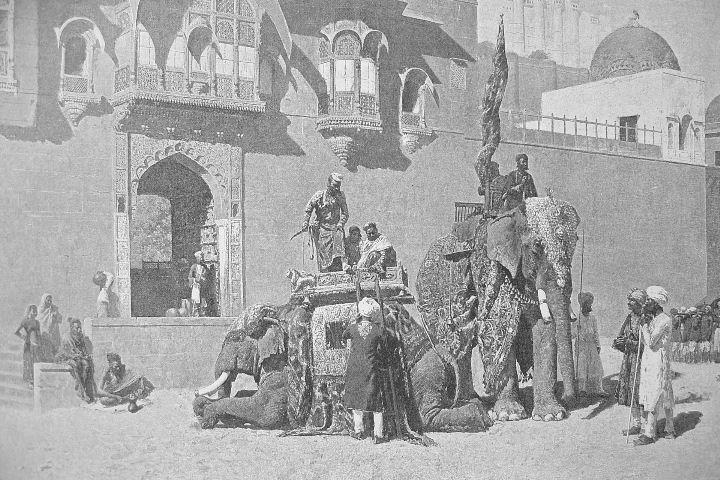 This first journey lasted four months and took him from Bombay to Benares, Agra, Gwalior, Muttra, Dig, Bindraban, Delhi, Jaipur, Udeipur, Ajmer, Palitana, Baroda and Hyderabad. The numerous sketchbooks in which he documented his journey and the many letters and travel accounts he sent to friends and the weekly magazine 'De Kroniek' give us a wonderful insight into the deep impression India had on him. The previous and the present lot are extraordinary examples of the work which resulted from his travels through India. The present lot, depicting a colourful procession with elephants leaving a palace gate, was painted circa 1918 and predates the enchanting pair of paintings with remarkably similar subjects. These were executed around 1926 following Bauer's second journey to British India.... It is noteworthy that Bauer painted these works some time after his actual visit. This goes some way in explaining the almost otherwordly atmosphere which permeates these works. Bauer is able to combine a precise eye for details in architecture, costumes and the complex working of light in ancient Indian cities with a certain idealisation from memory which infuses the whole with a sense of the magical. It is precisely this 'transparent veil' which Bauer describes that forms a large part of the appeal of these paintings. According to Bauer it is not the depiction of reality alone which forms the challenge in art but envisioning the chimerical, to heighten reality with an impression of the mythical."